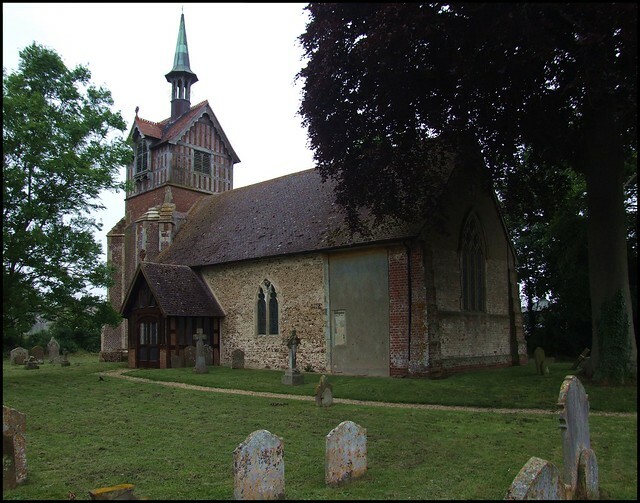 I have visited several thousand country churches over the last twenty years or so, and few experiences are more haunting than to tip up at some remote place and discover that it was at one time one of the stars of the Anglo-catholic firmament. 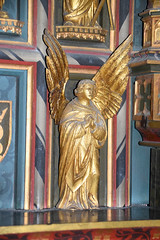 Most likely, it has long-since been subsumed into the Church of England mainstream, but that is not always the case. Whatever, the evidence inside speaks of a place which was once on the highest rung of Anglo-catholic tradition, and Swilland was such a place. 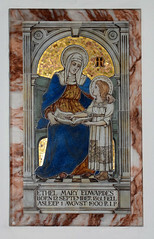 I remember, after I moved to Suffolk thirty years ago, spotting St Mary across the fields. My mind couldn't make sense of what I was seeing. What was it? Some strange Victorian folly? A water tower, perhaps? It looks like nothing so much as if a giant hand had picked up a Tudor cottage, and threaded it delicately over a lantern spire and onto the stump of the tower. The hand, in fact, was that of John Corder, an Ipswich architect remembered by Corder Road in the town, where several houses echo this Brothers Grimm gothick fairy tale. 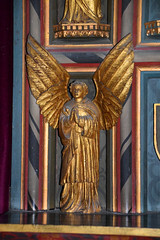 He also rebuilt the church at Hepworth, although he seems to have kept his imagination under wraps there. Pevsner, in a rare moment when his sense of humour shows through, described it as French in character and vaguely of c.1500 in its motifs. Sam Mortlock, however, quite liked it, and called it 'beguiling'. He went as far as to describe the lantern spire as 'perky'. The village runs into the larger village of Witnesham, which is outer-Ipswich suburbia really, but Swilland still retains a sense of its rural identity, and a feel of being a place where ordinary people live quiet lives. There is an excellent pub, the Moon and Mushroom. The name Swilland means 'a place where pigs are kept', although for miles around it is now barley which sprawls across acre after acre. 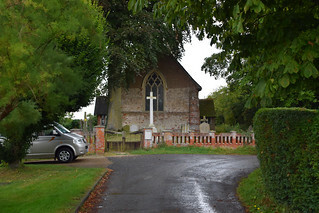 The main street through Swilland is one of my regular ways back into Ipswich from cycle rides, and so I see this church often. 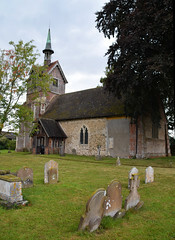 Swilland church used to be kept locked, but that has changed, and today it is open to pilgrims and strangers every day. 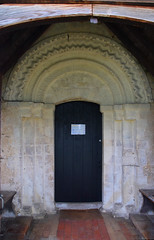 You enter the porch and come to face with quite the most spectacular Norman doorway in the Ipswich area. I think it must have been recut a bit, but it reminds us that this church was already old before the 15th century tower and bell were installed, and that it was ancient before John Corder came along. 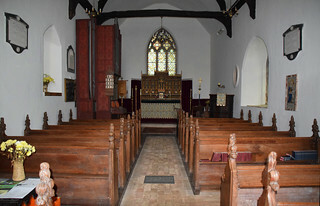 The surprise comes as you step inside, for the interior of this little church is redolent of that gorgeous late 19th and early 20th century Anglo-Catholicism, and while this may no longer be the tradition at Swilland, it has left enough of itself to show what it was once like. 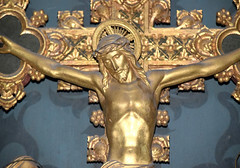 Your eyes are drawn eastwards to a tall, gilt reredos much in the style of Ninian Comper's at Wymondham, the gilt Saints filling niches either side of a crucifixion scene. I wonder who designed it? 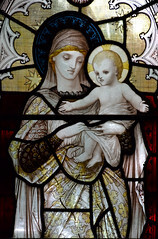 East Anglia's two great Saints, St Felix and St Edmund, are majestic in a nave window with a brass inscription to James Park Nelson and Philip Bicknell, bolted beneath them. 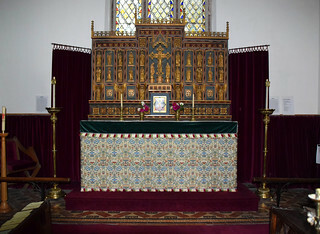 Father Nelson and Father Bicknell were the two priests who established the Anglo-catholic tradition here at Swilland. 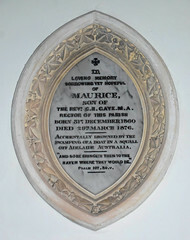 The brass grows into a Saxon cross inscribed with the words Jesu Miserere, and the window was set by their successor, Father Richard Faulconer. 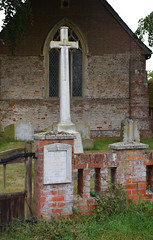 A third figure to the west of the entrance shows St Richard of Chichester and remembers Faulconer. 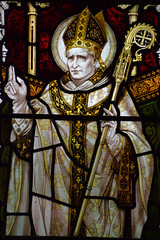 He had been ordained by Edward King, founder of the Anglo-Catholic Keble College in Oxford and later, as Bishop of Lincoln, champion of the Anglo-Catholic cause in both his writings and in the courts, which was often necessary in those days of fierce resistance to anything considered 'Romish'. In tribute, the figures of St Felix and St Richard, both Bishops, have been given Edward King's kindly face. 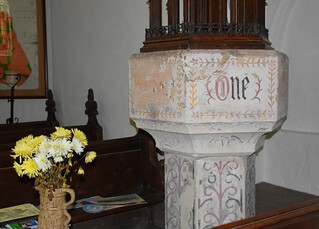 The 15th century font is painted in a 15th century style, presumably also in the 1880s - you wouldn't have got away with that in the 20th Century. Curiously, directly opposite the window remembering Father Nelson and Father Bicknell is a memorial to a minister of some twenty years earlier. 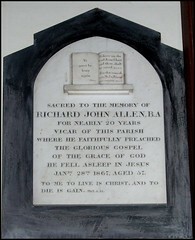 Richard John Allen appears to have died in harness in 1867, when Tractarian attitudes, and what it must be said was a snobbish attitude to the the literalism and triviality of Biblical fundamentalism, were already firmly entrenched in the Church of England. But Allen's memorial is surmounted by an open book with the words ye must be born again, a typically hardline response to Tractarian ideas about sacramental grace. 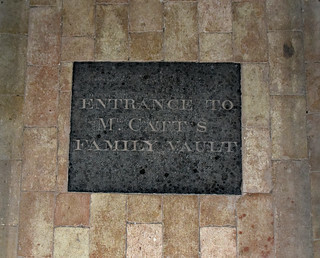 Beneath we are told that he Faithfully Preached the Glorious Gospel of the Grace of God. And this just twenty years before Faulconer's call for Jesu Miserere - it must have been quite a rollercoaster ride in this quiet little parish in those days when either party could accuse the other pharisaism, and frequently did. And yet, the Anglo-catholic party won in the short and medium term, and in the long term altered the face of the Church of England. For it had something that the biblical fundamentalists could not compete with - beauty. 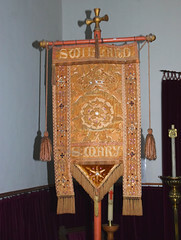 Evidence of this is a remarkable survival in the form of the processional banner worked by Father Faulconer himself, in velvet and gold thread, studded with coloured beads. 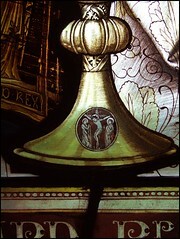 It shows a crowned rose as an emblem of the Blessed Virgin Mary. 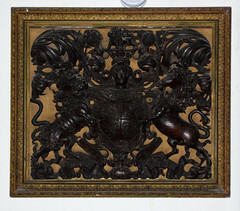 Near to it on on the north wall is one of the best carved sets of royal arms in Suffolk. As it is that rare thing, a set for Queen Anne, it must be counted one of the most significant in England.